Raccoons are the largest member of the procyonid family, which also includes coatis, ringtails, and kinkajous. Their most recognizable features are the black “mask” on their face, and the alternating rings of dark and light fur on their tails. They have five toes on front and rear feet, and the long “fingers” on their front feet make them look more like hands than animal paws. Until 1950, raccoons were considered totally absent from western Montana and Wyoming. Although they are now common in the northern parts of the greater Yellowstone ecosystem, raccoons are not frequently seen in Yellowstone Park. Raccoons are preyed upon by large predators like coyotes and wolves, and young raccoons are sometimes taken by great horned owls. Although raccoons are considered rabies vectors, almost all cases of rabies in U.S. raccoons happen in the eastern states and Texas. In 2015, 29.4% of all wildlife rabies cases in the U.S. were raccoons, and none of those cases happened in Montana, Wyoming, or Idaho. Bats and skunks are the primary rabies vectors in the greater Yellowstone ecosystem. Although they are members of the order carnivora, raccoons are decidedly omnivorous, eating a wide variety of fruits, nuts, and other vegetables. The largest part of their diet is invertebrates like worms, crawfish, and insects, but they are also fond of fish, amphibians, and bird eggs. 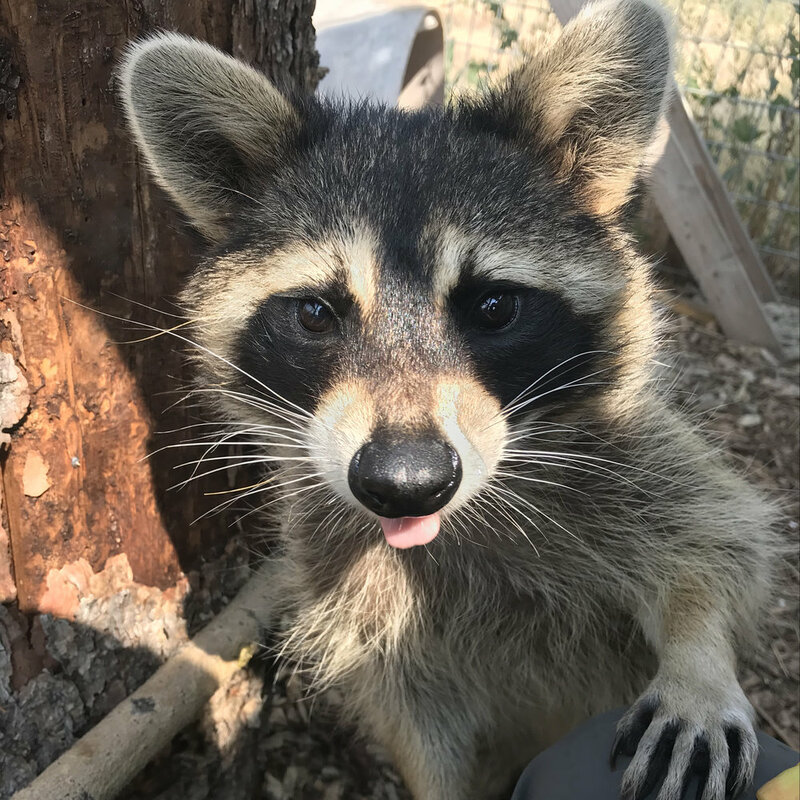 At the Sanctuary, we feed our raccoons fruits and vegetables supplemented with kibble for protein. Corn is a particular favorite. Raccoons are extremely good at climbing. They are one of few mammals their size that climb down trees headfirst; when doing so, they rotate their hind feet all the way around so they’re pointing backwards. They are also excellent swimmers. They stand on their hind feet to handle things with their front feet. Their best-known behavior is dunking their food — and other objects — in water. Researchers currently believe that this isn’t an attempt to wash the food, but an artifact of hunting for food in the water. Wetting their feet also makes them more sensitive. In the wild, raccoons generally live only 2-3 years, although they have been know to live over 20 years in captivity. MEEKA is unreleasable because she was hit by a car and lost one of her hind legs. She is still very active, and gets around well in her habitat, frequently climbing to high perches where she can look down on the world around her. COOPER is one of our newest animals. He was raised as a pet and is far too habituated to be released into the wild. Despite being cute and sometimes cuddly, raccoons generally make bad pets. They can be destructive, and their moods can change quickly.